No company does a better job delivering desktop printers equipped to handle your most demanding label printing applications. TSC has been building economical desktop thermal transfer printers that feature rugged dual gear-driven motors and large 300 meter ribbon capacity for over 15 years. We invented thermal transfer desktop label printers that feature 300 meter ribbons and are pleased to introduce our latest value model, the affordable, durable, easy to use TA200. The TA200 reinvents the definition of value for low cost desktop label printers. The price of the TA200 may be inexpensive, but it looks and performs better than its expensive competition. The TA200 features two durable gear-driven motors that are capable of handling large capacity 300 meter ribbons and large rolls of media inside its sleek design. If the 5" interior label capacity is not enough, simply add an external media unwinder and the TA200 can easily handle 8.4" OD rolls of labels designed for expensive industrial label printers. The print mechanism and ribbon handler of the TA200 is a modular design. The module may easily be removed from the printer for use in kiosk or print and apply applications. The TA200 offers a low initial price, uses the most cost effective supplies available, and is built to last. These virtually trouble free units feature a standard two-year warranty. Once you plug it in, you won't have to worry about it. 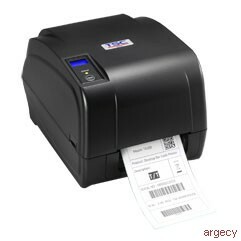 The TA200 can print a wide variety of labels ranging from shipping labels to compliance and general purpose product identification labels and tags. Other applications include automobile service shops, walk-in shipping and mail centers, and inventory control for stock rooms.